The movement of eukaryotic flagella and cilia is produced by the interaction between the motor protein dynein and the cytoskeletal protein tubulin, the main constituent of microtubules. Tubulin was identified and given its name in 1968 by Dr. Mohri, one of the authors of the article on page 397 – 415 of this issue. As shown in this illustration, flagella and cilia contain the so-called 9+2 structure, composed of nine outer doublet microtubules surrounding two central singlet microtubules. Dynein molecules are assembled to form a pair of projections (outer and inner arms) attached to a sub-tubule (the A-tubule) of each doublet microtubule and cause sliding between adjacent doublet microtubules. Another projection, the spoke, is protruding from the A-tubule toward the central complex that contains a pair of singlet microtubules, while inter-doublet (nexin) links connect between adjacent outer doublets. These multiple components dynamically interact with each other, resulting in sophisticated flagellar and ciliary movements. 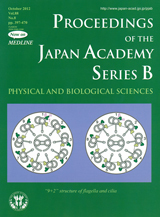 The above authors’ group has made various contributions to the elucidation of fundamental problems in the structure and function of flagella and cilia, mainly using marine invertebrate and mammalian spermatozoa. 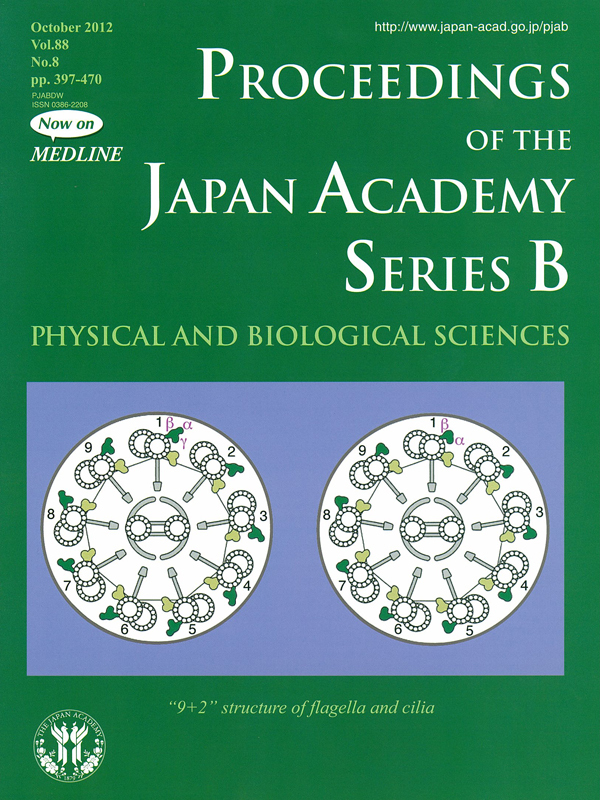 The cover illustration is a schematic representation of flagella and cilia cross-sections with special reference to the outer arm dynein. The outer arm dynein in protists and green algae, belonging to the supergroup Bikonta, consists of three heavy chains (α, β, γ; left), while that in animals and choanoflagellates, belonging to the supergroup Unikonta, consists of only two heavy chains (α, β; right). According to the discussion in the article, the latter may represent the ancestral form of outer arm dynein, while the former may have undergone duplication of one dynein heavy chain gene during evolution.